And here's one without "After"
I want to thank all of you guys for the faves and nice comments! It means so much for me! OMG OMG OMG, I love it!!! *running panically in circles* I have to go. I have to see the other loki pictures. Oh my god, I'm dying! Absolutely stunning of him! I love the effects! I wander if he ever wore the mask. Hey is this Graham McTavish?? also, I showed one of my friends at school today a picture of Loki (since they apparently HAVEN'T SEEN THE THOR MOVIES) and SHE SAID HE WAS UGLY! I was all like "WHAAAAAAAT??!" and proceeded to attempt to contemplate how someone finds Loki unattractive! 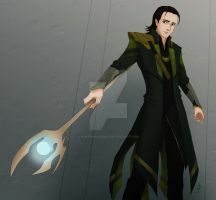 How can you like Loki when he hurting and killing innocents? People (like myself) like Loki because we understand and relate to him. Seeing the pain underneath it all, and relating to the feeling of being lied to, being hurt and being told you were never enough for anyone. The reason he hurt and killed a lot of people is because he finally snapped from all of that pain and suffering he went through, in his mind it was about conquering and becoming a king which really isn't that different from what Odin did, yet people still consider him a good person (I do too but I certainly don't consider him with out flaws). Unfortunately, like a lot of us, His pain went unnoticed by the people he cared about the most. The worst part is that he doesn't even hate his father or his brother even though he says that he does. He just wanted them to view him as a worthwhile person "I never wanted the throne, all I ever wanted was to be your equal". I'm not saying what he did was a good thing whatsoever or that I condone this kind of behavior, i'm pretty sure most Loki fans will tell you the same, but he is someone that you can relate to when you've been hurt to the breaking point. I do think he is a good person, he has just made some really bad mistakes, and those mistakes got people killed unfortunately. However, he had to grow in his own way just like Thor did. In the last two movies since this has happened, he has learned and became a better person for it even if he isn't 100% on the side of "Good"
Um the other part is because he is played by a really great actor, who is a very kind person in real life so I think maybe that plays a big part too. It doesn't help that Tom (his actor) is incredibly good looking as well.Anyways this is just my oppion on why and I understand if you don't like him you don't have to. Very cool! At first, I get more an impression of gorgeous color but little detail. Close, and rapt, attention shows a LOT of detail. This is one of my absolute favorites! I'm in love with everything about it. And it's amazing the kind of imagination a simple word can ignite...."After"
Incredible job. I really love this. sings: now you fallen under his spell. Can I use this as a cover image for my Loki fanfic (on Quotev)? It really suits the story! Of course I'll give you the credit and link to your deviantartpage. Wow. I love this. Well done. His eyes. They're perfect O.O I love it! You got SKILLS! I've had this printed on canvas and framed. I put a glass treatment on it that looks like ice crystals and frost. I'll post a pic as soon as I get it hung. Thanks for this. I love him! I had this printed on canvas and framed with an ice treatment on the glass (so it looks frozen). I'm going to post a pic just as soon as I have it hung. Thank you for this! NOREALLY, I ADDED TO FAVES. God.. It's like he's staring into my soul. I love it!! Your work is so well thought out and the end result is so polished that I always just assumed this was a promotional picture for Thor 2. I am stunned to realize this is fan made. Usually, no mater how well done, fan art is identifiable if only because the tone doesn't match the original. Congratulations, you had me fooled. I particularly like the way you dealt with the indistinct edge of Loki's right shoulder. Incorporating it as part of the lighting is simply brilliant, as is the execution here. Now that is what I'd like to see on a cold dark winter's night! So gorgeous! Loki is one of the sexiest things i've ever seen.